Dr. Mahita Reddy is a Gynecologist and Obstetrician in Jubilee Hills, Hyderabad and has an experience of 24 years in these fields. Dr. Mahita Reddy practices at Apollo Cradle in Jubilee Hills, Hyderabad. 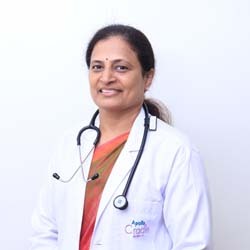 She completed MBBS from Osmania Medical College, Hyderabad in 1988, MD – Obstetrics & Gynaecology from Gandhi Medical College, Hyderabad in 1991 and DGO from Dr. NTR University of Health Sciences Andhra Pradesh in 1991. Thanks to Dr. Mahitareddy for her abundant care and attentiveness during my stay at Apollo Cradle. I had a very safe delivery. The care tips and suggestions provided by her are still useful for taking caring of myself and my baby even after baby’s birth. Grateful to the whole team! Mrs.Sameera mirza – Jubilee Hills, Hyderabad. Great doctor. Amazing facility. Apollo Cradle Jubilee hills is definitely one of the best hospitals out there. I was here for my delivery, under the care of Dr Mahitha Reddy. Such an amazing lady. She gains your trust right from the start and doesn’t let you down even a bit. She walks you through the whole procedure and helps you overcome any anxiousness. Mrs.Dr harshini – Jubilee Hills, Hyderabad. I visited Apollo Cradle for my delivery and my gynae was Dr Mahitha Reddy. She is not just one of the best doctors, but she is also a wonderful lady. She empowered us not only to have the most amazing experience of our lives. Her team and the nurses were also very caring and will make your time there happy. I would not hesitate to recommend Apollo Cradle to anyone. Thank you so much. It was an amazing experience at Apollo Cradle, from giving birth to getting pampered by the staff and every single person towards the end of my stay. Thank you so much Apollo Cradle, for making it a memorable journey. I really think this is the best place for women and children\’s care. Our baby was delivered here, amidst some of the most experienced doctors and staff. They are excellent in handling critical issues, and take minute precautions required for delivery and post delivery, and I recommend this hospital to everybody. Thank you so much to the entire Apollo Cradle team, nursing and hospitality staff. You all made our experience even better. Special thanks to our highly experienced doctor, Mahita Reddy for making our journey so pleasant. It’s great being at Apollo Cradle. The way they care for their patients is extremely good. I would recommend women to get treated at Apollo because of its pleasant environment & excellent care.